The public will be able to take a tour of the harbor during a Harbor Commission led harbor tour later this year. An ad hoc committee has been charged with discussing plans for the tour. Discussions of subsidized pumpout service and mooring management tabled to future meeting. NEWPORT BEACH — The Newport Beach Harbor Commission performed its annual reshuffling of leadership on July 13 selecting a new chair, vice-chair and secretary. Paul Blank was elected the newest chair of the Harbor Commission. He succeeds David Girling and will serve as chair though July 2017. Blank was just re-appointed to a second term on the commission by the City Council just one day before his election as chair. His commission term was renewed for four years on July 12, meaning Blank will maintain his seat on the commission through June 30, 2020. Commissioner Joe Stapleton was elected as the commission’s vice-chair, while Bill Kenney will serve as secretary. Brad Avery, Girling, Duncan McIntosh and Doug West make up the rest of the commission; all four have previously served the commission as a chair. Blank is currently the only commissioner scheduled to serve into the 2020s. The terms of two commissioners – Girling and Stapleton – are set to expire on June 30, 2017. Kenney, McIntosh and West will complete their current terms on June 30, 2018. Avery, who was re-appointed to his 4-year term in 2015, is on the dais through June 30, 2019. The commission resumed regular business after completing its leadership reorganization, including hearing an appeal by Newport Beach resident Kevin Moriarty to challenge a proposed commercial marina at 2888 Bay Shore Drive and creation of an ad hoc committee for a narrated harbor tour. The Harbor Commission hosted a narrated tour of Newport Harbor in November 2014. Commissioners served as tour guides, informing a ferry boat full of civic leaders and stakeholders of key capital projects in Newport Harbor. At the time Marina Park was still being built and the catamaran Cheyenne (whose owner planned to launch on a series of deep sea dives from Newport Beach) was still in the harbor. 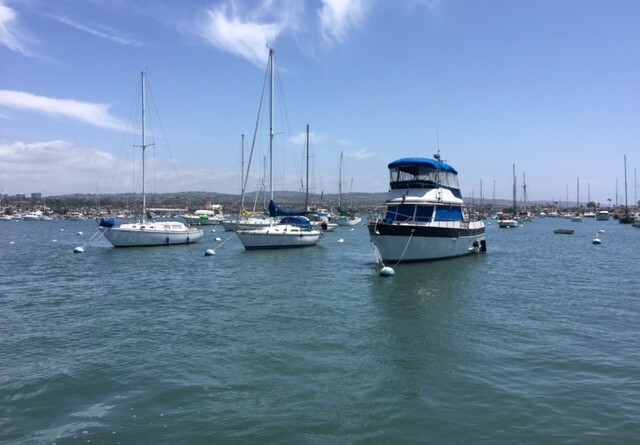 Commissioners are discussing plans to schedule a similar narrated harbor tour this year to update interested parties on Newport Harbor’s developments since November 2014. An ad hoc committee would begin the process of scheduling a similar event later this year. Two other agenda items on the commission’s July 13 agenda were tabled to a future meeting. The commission did not have a quorum to discuss a proposed subsidized pumpout service and the harbor’s mooring management. Only four of the seven commissioners are allowed to deliberate on both topics due to potential conflicts of interests. One of those four commissioners – McIntosh – was not present at the July 13 meeting. Both items will be discussed when the four selected commissioners – Avery, McIntosh, Kinney and Stapleton – are all present at the same meeting.